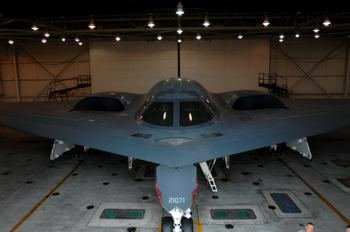 After my visit to Whiteman Air Force Base in 2009 I know I'll always feel a more than passing interest in the B-2 fleet. But it was still quite an odd feeling when I realised that the aircraft I spent a couple of hours sitting inside and walking around was one of the three that carried out a mission over Libya last weekend . I shouldn't have been surprised, as Spirit of Mississippi has participated in every conflict the B-2 fleet has been used in - but it's still an oddly affecting sensation. Whiteman's Public Affairs office posted a series of images of the three B-2s involved in the Libya mission earlier this week, and a careful look at those shows which of the 20-strong fleet was involved. The Spirit of Pennsylvania can easily be identified in from the shot showing it taxiing after landing, while the 1088 visible on the nose wheel door strut in another photo indicates that that aircraft is the Spirit of Louisiana. These were the last two of the 21 B-2s built, and were delivered to Whiteman in August and November 1997 respectively. The third tail number revealed by the photos is 1071 - Spirit of Mississippi. This was the sixth B-2 off the Northrop production line but as it was the last of the development models there was a considerable gap between its first flight - in February 1993 - and its delivery to Whiteman in 1998. Interestingly, all three were among the seven B-2s to be delivered as Block 30 airframes, meaning they were, on delivery, the most up-to-date B-2s then built - though it's doubtful this is particularly relevant today as the entire fleet has undergone considerable enhancement in the past 14 years. Another link back to my visit came with the credit on the photographs: Senior Airman Kenny Holston was the photographer who shot everything during my time at the base, and in the interim he's been deployed to Afghanistan where he's continued to hone his already considerable command of his craft. It's good to see he got back home in one piece. As this incredible report by David Axe for Wired's Danger Room blog showed, the margins between life and death out there are pretty thin, even when you're in a heavily armoured vehicle. Even almost a week later, precise details of the mission the B-2s carried out over Libya are understandably scant. There is no information about who crewed the aircraft, nor would I expect that to be made available - though I have it on very good authority that the RAF exchange pilot currently based at Whiteman, Flight Lieutenant Adam Curd, would not have been among the mission crews. The terms of the RAF/USAF exchange programme mean that, even though the mission started and finished from Whiteman, he would have to have applied for permission to deploy if he was to have taken part; no such application was made. What is known is that the three aircraft left Whiteman - which is about as close to the geographical centre of the contiguous United States as makes no difference (the exact point is debatable but there's a marker near the hamlet of Lebanon in Kansas, about 330 miles to the west) - on March 19. Their round trip of over 25 hours involved four mid-air refuellings: these are no mere detail for the air crews considering that the fuel inlet is above and behind the cockpit so the pilot has to connect to the tanker without being able to see he's done so successfully; and this very automated aircraft has to be flown by hand during contact, to keep the aircraft steady in the slipstream of the tanker, for a period of around 45 minutes to take on a full fuel load. The two-man crews take turns at the controls between "pressure points" in the missions - take-off, refuelling, weapons release, landing - to have 45-minute naps in a fold-out camp bed at the rear of the cockpit: the human effort involved to stay alert and in control of a $2bn piece of hardware and fly it straight and level at 400 miles per hour below and behind an airliner-sized tanker, after 20 hours in the air already, is more remarkable than the aircraft itself. The USAF has also confirmed that the three aircraft delivered a total of 45 2000lb Joint Direct Attack Munition weapons. The B-2 is far from the only aircraft that can carry 2000lb JDAMs, but it's the only one that will ever perform such a mission from so far away. I doubt there'll be any more B-2 missions during this conflict. Other coalition aircraft capable of delivering the same kinds of weapons are now in place much closer to Libya - the RAF now has Tornado GR4s and Typhoons stationed at Gioia del Colle in southern Italy, for example - and there's no point in risking such an expensive and scarce aircraft (or its crews) when there's no active radar for it to sneak through or functioning missile defence system for it to wriggle past. The B-2 was always about getting the first strike in against a high-threat air defence system: inside a few days, coalition air power and sea-launched missile attacks have stopped Libya's air defences from functioning effectively. The B-2 has now been used in four different conflicts: the Balkans, Afghanistan, Iraq and Libya. I can understand why people might think this makes the aircraft an expensive white elephant, but when you start to try to understand what it's for the picture is rather more complex. You wouldn't use a Rolls Royce to pop down to the corner shop if you had a Mini you could use instead - parking would be tricky, someone might steal it or scratch it. The same goes for the B-2. It's there for the times when the US or its allies need to deliver precision weapons at the first stage of a war when the enemy's capability to defend itself against air attack is either unknown or known to be good. At the Mission's End, the bar and recreation centre at Whiteman, there are a couple of what I guess amount to "trophy cabinets", displaying memorabilia and photographs from the 509th Bomb Wing's history. This is the same outfit that dropped atomic weapons against the Japanese in 1945, so there's plenty of history to go round. But perhaps the most striking display is a set of three pictures of a domed building in Baghdad that B-2s were tasked to attack in 2003. It was a key centre in Saddam Hussein's command-and-control network, but it was built, quite deliberately, next to a school - as the first picture in the three I saw showed. Mission planners calculated that if a bomb could be placed at the centre of the domed roof, but fused to explode once it had penetrated the dome and entered the building itself, the walls would contain the blast and ensure no damage was done outside the building's walls. To do this called for incredible skill on the part of the B-2 mission crews, and for maximum reliability from the weapon. The mission was carried out, but in the initial assessment of the damage, it was believed to have failed. The second picture - like the first, taken from above - showed that the building was undamaged apart from a small hole at the top of the dome. It was assumed that the bomb had failed to detonate, until ground troops entered the building after the regime had fallen, and found that the interior was completely obliterated. When military people talk about "low collateral weapons" and "precision strike", this is the kind of textbook example they're evoking. And whatever your feelings on the defence industry, the political imperative driving military technology, or the rectitude or otherwise of any particular conflict, there has to be recognition of the immense professionalism and skill that goes into an operation of that terrible complexity: to stop a tyrant killing people is one thing, but to do it from the other side of the world without harming the people next door is mind-boggling. There has been criticism of the failure of the USAF to use its F-22s in this conflict, and it's clear that its lack of effective interoperability with other platforms has been a major issue. But the same thing is true there as with the B-2: why risk it when you don't have to? This isn't the sort of conflict that requires a high-performance supersonic stealth fighter - as current figures of one Libyan aircraft destroyed (and that a trainer after it had landed) emphatically underline. As General Wheeler said to me when I interviewed him at Whiteman, the B-2 is primarily a deterrent - and the point of deterrents is that you have them in the hope you'll never have to use them. Spirit of Mississippi is likely back in its hangar at Whiteman as I type; and I hope it stays there for all but training missions for the rest of its operational life. But that doesn't mean it's a waste of money. The worth of the B-2 or the F-22 - or any weapons system, ultimately - is not a function of weapons deployed divided by combat missions completed times dollars per year of development - it's measured in the far more abstract, completely unknowable terms of the conflicts that the aircraft's existence prevented happening. Nice update, Angus. Spot-on with your comparison btw Roller and Mini, too. If I may promote: It was a pleasure working with you on the original story. SrA Holston (soon to depart to Charleston AFB in South Carolina) is one of the finest photographers I've ever known. I've seen one of his images all over the world, from the day he sat out in a thunder storm for a classic. I hope you can post it, but if not. . . at least enjoy it!